What’s better than farm fresh eggs, with bright orange yolks, on toast with homemade butter? Healthy Hens Love Nesting Herbs! 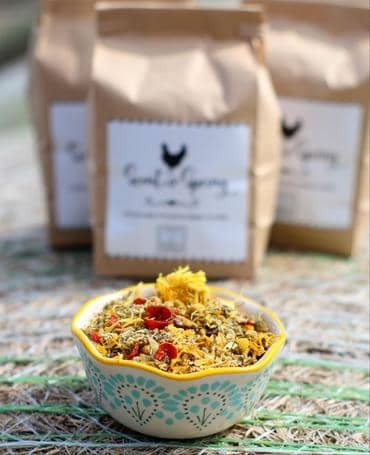 Discover nesting herbs for your hens! Great eggs come from great treats! 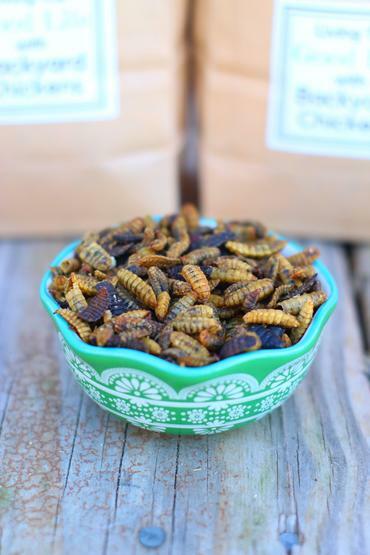 Love spoiling your hens with dried insects? Click here! These days, I can’t even compare my hens’ eggs to grocery store eggs. My hens produce wonderful, better tasting eggs with golden/orange yolks that have an incomparable taste (at least compared to grocery eggs). When I look at one of my eggs, I see the chickens foraging in the sunshine, engaging in their own chicken politics, and gobbling up the treats I leave for them. There’s a lot of satisfaction in those eggs. Since my last post, I’ve received questions about whether different colored eggs taste different and my secrets to feeding for those coveted golden yolks. Well, we’ve run LOTS of tests on our farm with our chickens – and we figured out what helped our chickens lay better eggs! The foundation of that diet is the wheat grass fodder I grow. Wheat grass is very high in protein, and protein is key to healthy chickens and better tasting eggs. You can also use barley, but I use wheat because barley isn’t available in the quantities I need in my area, and I try to support local businesses. I explain how to grow fodder in my How to Grow Fodder and Why You Should guide. They love eating the grass, and scratching through the remaining seeds to get at the roots! I also add alfalfa and grass hay, especially in winter. Who doesn’t love reminders of summer when you’re trapped inside? The alfalfa and hay add protein and they get to scratch through it to get to other tasty bits of their dinner. I’ve also found that kelp and nori add protein, and my hens love it. Along with the wheat grass, I add oatmeal, alfalfa, kelp, garlic (fresh or powdered), and dried oregano to my chicken’s feed. The oatmeal provides fiber in an easy to break down form. Recent studies have shown that garlic and oregano have antibiotic properties, and help keep hens healthy and disease-free. 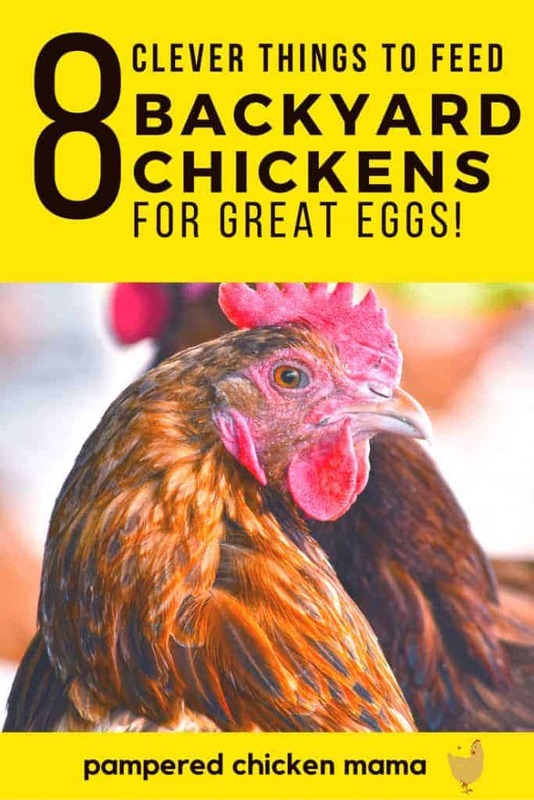 In fact, some large egg operations have been able to eliminate antibiotics completely from their hens’ diets after adding oregano and garlic to their feed. They claim their hens have never been healthier. Chicken farmers in Italy have long touted that for better tasting eggs, a forage-based diet is the secret to golden yolks (calendula helps also!). I don’t use a set recipe. I just sprinkle and mix. I also add kitchen scraps, as well as fresh veggies like cabbage, tomatoes (which they can pick through), etc. Since it’s winter and their water keeps freezing, the fresh veggies help them stay hydrated in addition to giving me better tasting eggs. In warmer weather, I add weeds I pull from the garden, grass clippings, fallen fruit, etc to their diet. And they give me great tasting, golden yolked eggs. And a bonus? The garlic keeps the coop smelling nice! This spring, I’m also going to add a mealworm farm to the homestead, specifically for the hens. I think they will love the added protein and “hunting” their own bugs (especially since, thanks to neighbor dogs, I can’t let them free range anymore). For yolks that look like lovely balls of sunshine, I think the most important thing is happy hens that have a diet high in protein. Want to read more? Check out this article by the University of Colorado! 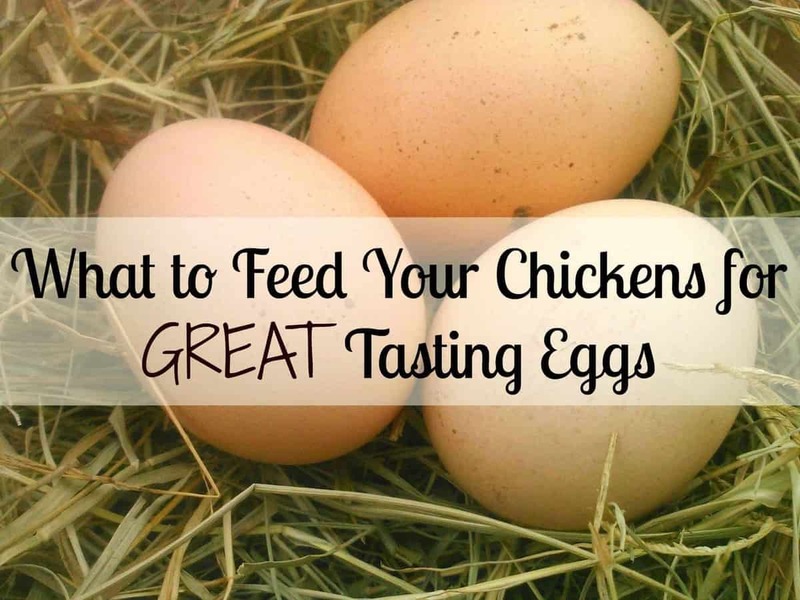 What To Feed Your Chickens For Great Tasting Eggs! I have yet to start keeping Chickens but it is all being planed for the near future, when I was a boy we had an allotment over here in England and I remember they had Chickens on the next allotment and I spent a lovely afternoon digging up big worms and throwing them over, their capacity to eat was endless, today I have my own large allotment and in the winter I get a lot of mice move into my greenhouse and feed on my stored stuff – so I trap them and throw them over to my neighbours Chickens and I always amazed at their ability to choke them down whole. I have done masses of research into keeping Chickens and also intend on keeping and breeding a selection of bugs for my girls and I like the idea of growing various grains for them. My Grandmother feed laying mash scraps, let them run wild they eat grass bugs all day. They went to coop in evening shut them in every night .she had dark yokes good tasting eggs. I am enjoying reading your articles and have subscribed to your news letter. I am a newbie at this. So, I’m sure I will be in contact often. Lol My girls are now 6 weeks old and I’m ready to put them in their coop. I was reading about what you feed them…but there is not a recipe. I know you said you just mix…can you give me some kind of portions? I have six girls. Also, do they have to be a certain age before I can feed them this particular diet? Hi Karen! 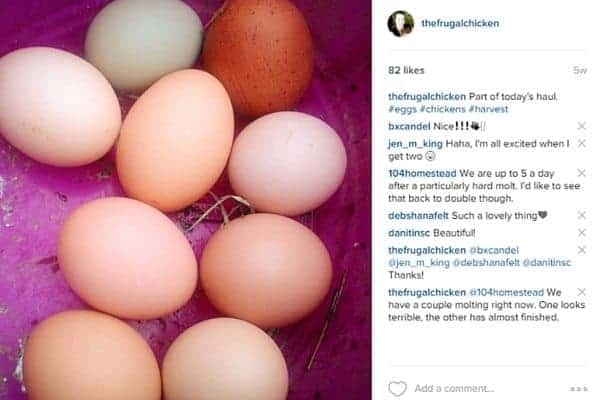 If you’re looking for a specific recipe, you’ll love my article about making your own feeds here –> https://thefrugalchicken.com/organic-homemade-chicken-feed/ This feed is for layers. It would work for older pullets (after 16 weeks) as well. Just remember for layers to also offer a calcium supplement such as oyster shells too. I feed my hens 1 cup each per day (split between morning and night). You might have to feed more or less depending on your flock, but this is a good place to start. Hope this helps! My chickens have feed table scraps and free range. Their absolute favorite is papaya. We moved into a house with lots of papaya trees. Plenty to share. I also saw one if mine eat a lizard she caught. I feed my chickens fresh minced Garlic in cultured yogurt with some kind of mashed berries every other day, and they love it! I used to mince garlic and put it into a container in the coop, but it turned green and they did not eat it. My chickens “aren’t” eating the greens (lettuce, etc.) that I’m giving them from the garden. Why? Can they have the peelings as well? I have a small operation with chickens and a few ducks. After AGES the ducks finally started laying and I LOVE their eggs. I have about thirty eggs in the incubator so I’m hoping for another thirty chickens in a month (right!). Here’s my question: I can tell the difference between the leghorn (white) eggs and the “others”, but I can’t tell the difference between the others. There are light brown, darker brown, spotted brown, but I don’t know which chickens they come from. I will do some experimenting in a bit, but would you know? How much garlic do you give them? We live on the Alaskan coast and I give my hens as much seaweed as I can collect and all the fresh salmon roe I can get they are very healthy. I’m got to try adding the garlic and oregano see if it makes a difference. Seaweed and salmon roe are great to give your chickens! We had chickens when I was a teenager. We fed them everything, including chicken and eggs haha. When my mom would make a pork roast, I’d take the fat and skin and nasty stuff out to the coop and let the chickens and the rooster (cuddles) eat it all. I once watched my brother throw them a stick of butter which they LOVED! Not sure if it was good for them, but it was definitely hilarious! My wife and I are getting chickens in a few months. I’ll be feeding these ones better haha. Many have mentioned letting the chickens free range during the day, I would prefer to do this but our area has a VERY high raptor population–am I better off leaving them in their run/coop area? Thanks! Yes, if you think there’s a high likelihood they will get eaten. Another option is to give them supervised free range time where you’re watching them. Birds of prey are less likely to attack if a human is around. I had 4 hens but lost one to a coyote that forced its way under the chicken fence. Since then I added electric fence wire to the bottom of the fence. I had strung wire along the top of the fence to keep the racoons out. My chicken yard now looks like Alcatraz.